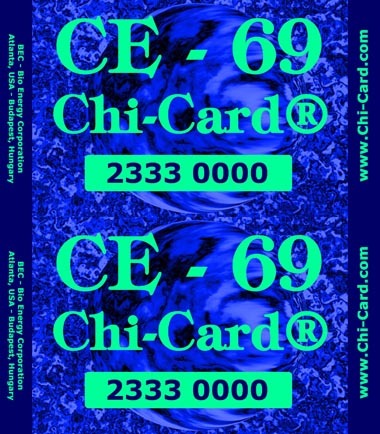 For You, the Chi-Card® Secures a Continuous Supply of Orgone energy (same as Chi energy) with all its Benefits! Your credit-card size Chi-Card® is energy in your wallet !!! In fact, with this continuous extra powerful transfer of Chi Energy, you can now have all the energy you need to begin taking control of money, profession, business, relationships, and life itself! As a natural consequence of the invention of the Orgone Generator®, Karl Hans Welz was able to explain scientifically any action at a distance or perception at a distance. Consequently, our understanding of manifestation techniques, ESP, remote viewing, shamanism and even what many call miracles will never be the same again, and meanwhile entirely new technologies have evolved from this new scientific understanding of life force, or Chi Energy. Transfer of orgone energy at a distance, which was practiced by humans throughout their history, can now be understood as scientific fact. It is the transfer of life force, or orgone energy with the help of identical or equivalent structures: structural links. Based on this science, Karl Hans Welz created equipment to use life force for the transfer of signals across the Atlantic. As expected, no amplification equipment was needed, i.e., life force transferred with full force even at that disctance. Your Chi-Card® transfers orgone energy from one of your Chi-Generators® in the same way as the TC 99 and other orgonite®-based transfer units. The difference is that, unlike orgonite®, the Chi-Card® does not amplify the life energy. 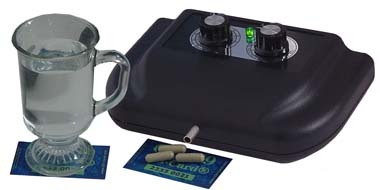 The image shows you how you can use your chi-card® to transfer the energy of supplements into water or any other drink.